First off, let me tell you how surreal I find the song choices. Between Silent Night, Joy to the World, The First Noel, God Rest Ye Merry Gentlemen (of which they do more verses than many other recordings I have) and Hark the Herald Angels Sing, over a third of the songs are religious carols. To me, that seems like a really high percentage for a kids album based on a fictional character. Especially since said fictional characters are a bunch of super-powered children who live in a sort of magical pocket dimension in the sky, who are ultimately responsible for light, spring and color, and thus continued life on earth. I find the image of the Color Kids singing about Jesus completely and utterly bizarre. Don't forget they have chipper little voices, and are backed up by synthesizer. Another important point: A Gift of Love is a song that I had only ever heard on Disney: The Twelve Days of Christmas. 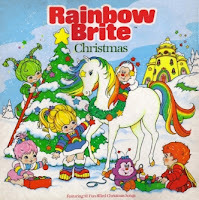 It apparently originates here, and the lyrics make much more sense for Rainbow Brite than for Mickey and Co.
Two of the songs that aren't religious (Twelve Days of Christmas, Deck the Halls) have all their lyrics revised for the setting, and are amusing, if not actually good. I'll readily admit, I'm softer on all this cheesy kids music than Erin would be, because little-kid Christmas is about the surest way to my nostalgia button. 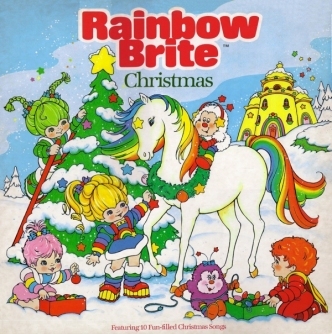 And while I never had this album as a child, there was a time when the other Rainbow Brite music cassette: Paint a Rainbow in Your Heart, was on continuous play in my house.